Salt, in its natural form and in the correct balance with other minerals like calcium & magnesium, is critical for our bodies to function. However, we also need to consider the type of salt we’re putting into our bodies. Let’s take a look at what a “good salt” can do for our health. Himalayan pink rock salt is mined from ancient sea beds, untainted by most environmental toxins, and is purported to contain over 80 minerals & other health-promoting constituents. You can use pink salt liberally in cooking, but you should avoid table salt – which is basically just sodium chloride! It is also chemically processed and devoid of the beneficial minerals you should be seeking from your food and seasonings. Ok, got it – no table salt, but why Pink Salt over my beloved Sea Salt? Unfortunately, most of what is labeled “sea salt” at the grocery store is now refined, and stripped of minerals as it has become mass-produced. Plus, our oceans aren’t getting any cleaner! Is there a specific type of Pink Salt I should be consuming? Glad you asked – YES! Besides sprinkling on food during cooking, or adding a pinch to some homemade chocolate, a ‘sole’ made with Himalayan Pink Salt is my top choice for reaping more of its benefits. In German, the word ‘sole’ (pronounced ‘sol-ay’) is derived from the Latin word “sol” meaning sun. Therefore, ‘sole’ basically means fluid sunlight or fluid light energy. Fill a mason jar with ~1 inch of salt. It is suggested to use pink salt rocks (look for “ethically mined”), but you can also use Celtic or Grey Sea Salt – very important that it is unrefined though! Then fill the jar with clean, filtered water until it is ~2 inches above the salt level. Stir gently, place non-metal lid on top, and leave overnight to infuse. Never allow metal to come in contact with your Sole as this will negate the ideal ionic solution you’re trying to create. In the morning (or after 8 hours), if all the salt crystals/rocks have dissolved, add a few more crystals or 1 more rock to the water. Your Himalayan Pink Salt Sole is ready when the water becomes fully saturated with salt. This occurs at 26% saturation, where the liquid medium cannot hold any more particles in suspension. You’ll notice that the salt will no longer dissolve at this point, and there should always be salt crystals visible at the bottom of the jar. Dr. Ray Peat explains that all cells need a good balance of sodium & potassium. This in turn enhances circulation, allowing the body’s bio-electric currents to flow freely. Bet you didn’t know your body was a powerhouse of electricity! It stimulates metabolism and supports weight loss due to greater energy, better sleep quality, and improved hormonal balance. Within minutes of drinking Sole, your body’s metabolism and adrenals are stimulated. One of the main functions of the adrenal glands is to retain salt, under the direction of the hormone aldosterone. So when someone has Adrenal Dysfunction (or dysregulated adrenals) and consequently, an inability to cope with stressful situations, aldosterone tends to be low and we naturally begin to crave salt because our sodium-potassium ratio is out of balance. This is also why we tend to pee a lot when we’re stressed! It’s also not recommended for someone with poor adrenal function to consume foods high in potassium, like bananas & coconut water, as it would push the sodium- potassium ratio further out of balance. Now you know the WHY – but how much Sole should you drink daily? It is recommended to consume 1 tsp in a little warm water every morning on an empty stomach. It’s optional to add a bit of fresh squeezed lemon juice to create a metabolism-boosting, adrenal-supporting, digestion-regulating morning tonic. However, beware the potential for initial detox symptoms, such as headache – so start slow, and more is not better! You can even cook with it! 1 teaspoon of liquid salt sole = 1/4 teaspoon salt. I often use it when making one of my most popular recipes Resistant Starch Rice made in the Instant Pot. After you’ve used up the Sole, add more water and salt as above, until the water is again saturated. Remember, there should always be undissolved salt crystals/rocks on the bottom of the jar as this is proof that the water is totally saturated with salt and you have a nicely balanced salt solution. Here’s a cool fact: your Sole is completely sterile, anti-fungal and anti-bacterial, and will never spoil. Neat, huh? CAUTION: drinking daily Sole can be a great addition to your personal health routine and in supporting hormones, but it may not be right for everyone. 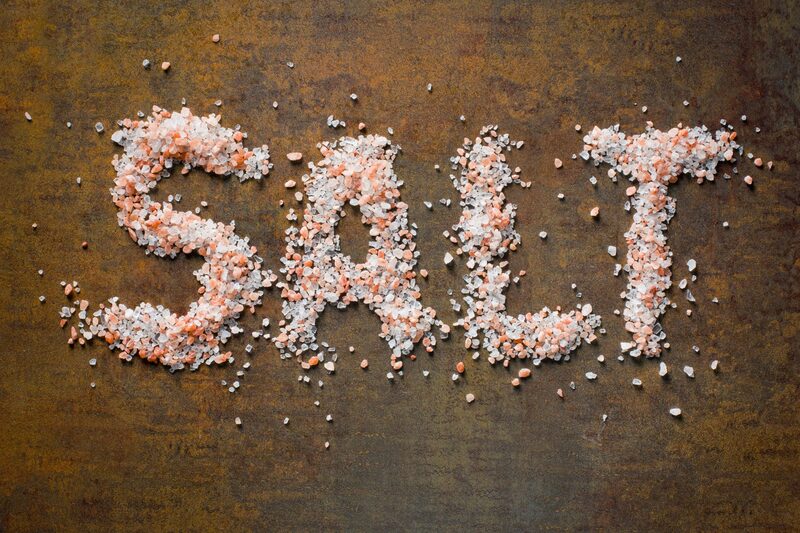 If you have kidney disease &/or high blood pressure, please consult a qualified Health Practitioner to work with you on balancing “good salt” consumption. I haven’t heard of this before. But I do love salt – yum! I have been drinking this every day and taking magnesium and I feel like a new person. Now trying to convince my husband to do the same. I love pink salt. Use it every day! Why do doctors always suggest lowering salt intake? I always feel better when I eat my sea salt daily!